Although general veterinary practitioners can diagnose and treat many conditions, treating heart problems in cats requires specialized training in veterinary cardiology. Cardiomyopathy, which literally means disease of the heart muscle, is a cardiac condition that causes a thickening and/or stretching of the heart's walls. The two main forms of cardiomyopathy are Dilated and Restrictive. Although there are many types of potential heart problems in cats, Hypertrophic Cardiomyopathy is by far the most common heart condition to affect the feline population. What Causes Heart Disease In Cats? According to the American Veterinary Medical Association (AVMA), heart disease in cats affects 1 of every 10 cats worldwide. Heart disease is a condition in which an abnormality of the heart is present. Heart disease in cats is a medical precursor to congestive heart failure in cats, because heart disease can lead to congestive heart failure in cats if untreated. Asymptomatic: Heart disease in cats is detected, but there is a lack of any outward signs. Additionally, a heart murmur in cats or arrhythmia may also be present. Mild to moderate heart failure: Significant clinical signs of congestive heart failure are in evidence both at rest and while active. Advanced heart failure: Critical clinical signs are evident, including respiratory distress, ascites (fluid in the body cavity), and profound exercise intolerance.The prognosis will worsen with each passing stage, and the need for aggressive treatment will increase. The above symptoms can indicate one of many possible conditions, including feline heart disease and potentially something unrelated to the cardiovascular system. If you notice any of the above symptoms, we recommend scheduling an appointment with our veterinary cardiologist immediately. A blood chemistry analysis can also determine the level of thyroid hormone present in the bloodstream. This is very helpful when evaluating hypertrophic cardiomyopathy in cats, because an overactive thyroid gland can be an underlying cause of heart disease. Presently, there is no cure for hypertrophic cardiomyopathy in cats. Changes to the size and structure of the heart muscle are irreversible. The longer HCM is allowed to go untreated, the more severe any changes become. However, in some cases where the heart disease is secondary to a treatable condition such as hyperthyroidism, then the symptoms may be alleviated when the underlying condition is corrected. These changes provide the heart more time to fill and drain, thus allowing for a reduced chance of damage and failure. Because heart medication is modifying the function of the heart, it is important to strictly follow your veterinarian's recommendations for dosage and administration frequency. Owners of cats with HCM should monitor their feline friends for any changes in their condition, even if they seem minor at first glance. This includes learning how to monitor respiratory rates and other vital signs at home, which a veterinarian can help with. It is also important to come in for a exam with any changes in your cat's health or behavior and keep up all recheck appointments for the best outcome. 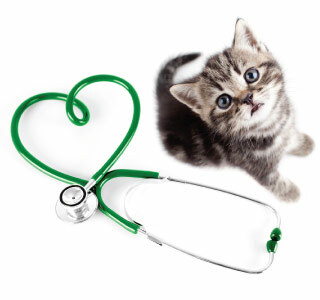 Many felines diagnosed with HCM eventually develop signs of congestive heart failure. Cats with HCM are at risk for developing blood clots that can escape the heart and eventually become lodged in a blood vessel that has become too narrow. This is called a thromboembolism. A common area for this to occur is the hind quarters region, at the point the aorta splits before going into each rear leg. If this happens, paralysis and severe pain will result. In fact, the paralysis and pain are very common reasons many owners initially bring their cat to see a veterinarian. However, what they thought might be a broken leg or lameness is actually hypertrophic cardiomyopathy in cats. With supportive veterinary and in-home family care, between 40%-50% of patients with thromboembolic disease can internally break down clots and regain some amount of limb function over time. Due to the nature of how blood clots fragment and disperse throughout the body, cats that experience blood clotting once are at a significantly increased risk of developing another clot within the following weeks or months. Because of the somber prognosis for cats that have suffered a thromboembolic event, some owners elect euthanasia. The existence of these variables and possibilities make both preventive and follow up care of the utmost importance where heart disease and congestive heart failure are concerned. If you suspect that your feline friend might be at risk for, or suffering from, any heart conditions, please contact us immediately to schedule an appointment today.